Our services in the area of leadership and project management seminars are sector-independent. Therefore our clients are NGOs as well as medium-sized companies and international conglomerates. Of course compando offers its seminars in German and English language. To impart complex issues in an understandable and easy way is a skill and a target that I try to meet every day. We conduct our seminars with commitment and enthusiasm and therefore we secure a sustainable training for your employees. Every client is unique and so are the requirements. That is the reason why we offer customized content to our clients that are immediately applicable in day-to-day business. To ensure the sustainability of our seminars we offer so called „come back days“ to our clients. This means that the trainer comes back for one day to discuss the challenges regarding the implementation of the learned content with the former participants of his/her seminar. 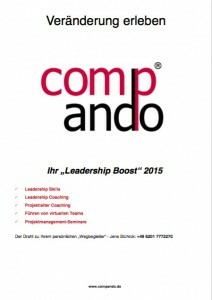 If your want to know more about the seminars of compando please click on the „Leadership Boost“ and download your own copy of our seminars including all needed details. Get your trainings tailor-made to fit your needs.